The latest college campus under scrutiny for alleged racist actions is Southern Methodist University in Dallas, where fliers have been put up warning white women not to date black men, the Huffington Post reports. 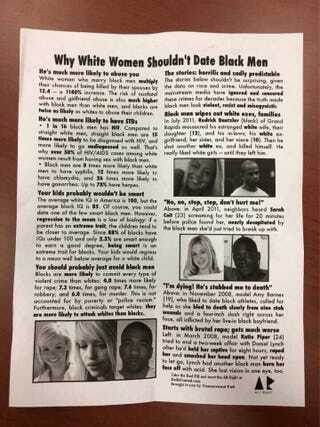 The fliers, found in a dorm and the science building on campus, are titled, "Why White Women Shouldn't Date Black Men." "SMU condemns the racist and hateful message in these fliers," said a university representative. "These messages have no place at SMU and are in opposition to SMU’s values and commitment to an environment free from discrimination." According to HuffPost, the fliers include offensive claims such as black men are "much more likely to have STDS" and "your kids probably wouldn't be smart." Apparently the fliers, which have an "alt right" logo in the bottom-right corner, have appeared on at least two other campuses this fall.